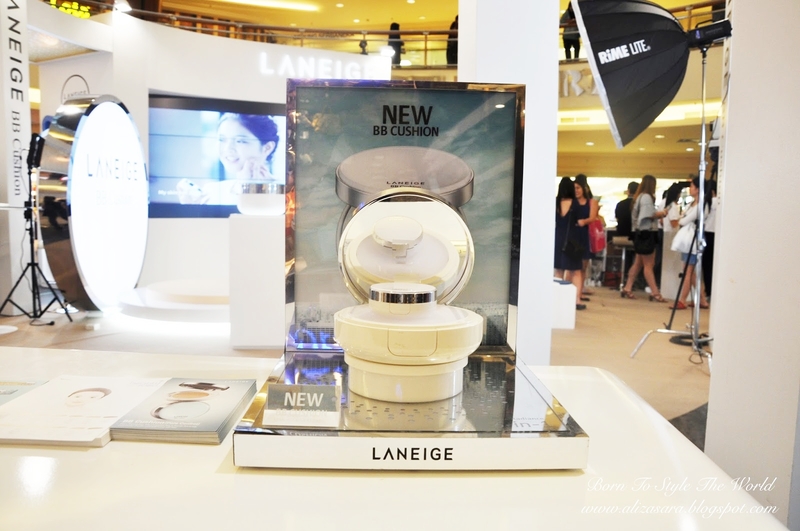 I am huge fan of Laneige BB Cushion, it's actually one of my favourite so far. In fact I have already done a review for their BB Cushion Pore Control product in the Mini Pore Range post so you can check out the full review there. In this post, I'm sharing about their Road Tour that I attended last month where I got to learn more tips and tricks regarding the BB cushion makeup trend. Do you know that BB stands for Blemish Balm? 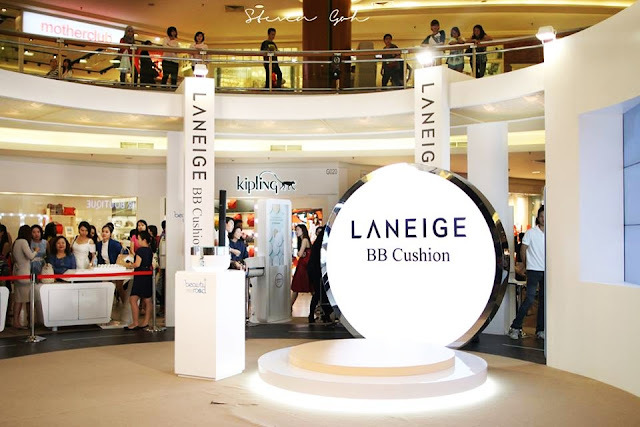 Laneige Beauty Road which was held in Mid Valley Megamall was aiming to share with the public about the Korean makeup trend nowadays that loves BB Cushion products. The tour is happening in a total of 7 countries; Malaysia being the third stop. Personally speaking I totally agree with the rave since BB Cushion is so portable, although a bit bulkier than normal compact powder. Touching up with BB cushion compact is also easy and fast, and I think the product last quite long too. 1. Pore Purifying Complex for pore control and protection. 2. Pore Coverage: Covers pores and bumps with soft focus powder which diffuses light. 3. Semi Matte Finish: Dual powder formula, anti darkening, sebum control for fresh look. 4. Water Resistant: Strong resistant to perspiration and sebum for long lasting makeup. 5. Soothing Effect: Fresh cooling sensation- refresh skin and soothe fatigue skin. 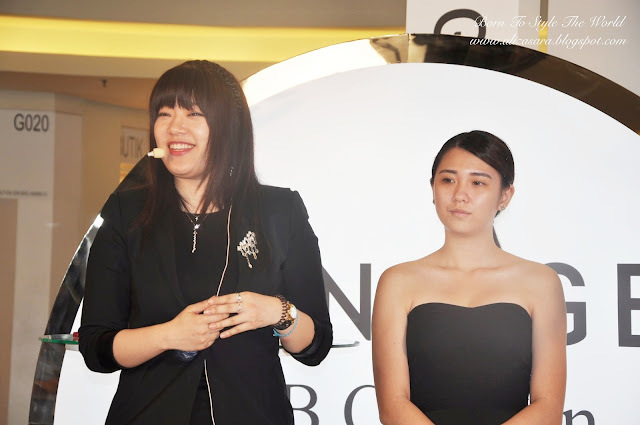 The most exciting part for me was to see the demonstration from Cat Koh, Laneige proffesional makeup artist. I've actually heard of her name before so it was really a golden opportunity for me to learn something valuable. Another special part was the appearance of Hwang Se On, a Korean model working with Laneige. She is a celebrity model in Korea and during the event she shared with us about her opinion on Laneige products and her secrets on keeping her skin healthy. 1. Keep hydrated: Drink a lot of water. Laneige Brightening Sparkling Formulation in their product helps too. During the makeup demonstration, I was able to gather some tips and tricks on how to do makeup the Korean way. They usually love a more natural and non heavy look so the tips are suitable if you love Korean makeup style like I do. The makeup demonstration was done on only half of the face of the model so we can see the difference from before to after. 1. Base: Using BB Cushion, apply the product with a tapping motion. 2. Dewy Look on the Skin: Apply highlighter slightly above cheekbones, on the cupid area of your lips. 3. Eyebrow: Korean look prefer a natural looking eyebrow, which is slightly straight instead of arched. 4. Eyeshadow: Use soft colour, to give natural pinkish and brownish look. 6. Eyeliner: Make sure to fill in the area under eyelashes too. 7. Blusher: Apply blusher by tapping and then touch up a bit with BB Cushion to give off natural flushes. 8. Lips: Korean love gradient lips looks. Use Laneige Two Tone Lip Bar to achieve. 9. Final touch up with spray mist to fix the makeup in place and give a moist look. The roadshow was filled with so many other interesting activities like a makeover and games. I am usually the unlucky type but on that day I managed to win a cute mini BB cushion too. Visitors could also try out the BB Cushion at the testing stations and find the perfect shade for their skin tone. Laneige BB Cushion offers a lot of shades, not to mention the new shades for pink undertones so there will definitely be a prefect match for you too. I also managed to watch a dance performance of Dancing 9 members which was really fun! You can check out the Laneige Malaysia Facebook Page to follow their updates or visit their website at www.laneige.com.my.